WordPress Tutorial Series is both for the new and power WordPress users. Working with FTP Folder Content is an important part of management of WordPress. To read our any previous WordPress Tutorial of this WordPress Tutorial Series, open any post like this as we have not compiled the full content. With any kind of webhosting – be it a Shared Hosting, Virtual Private, Dedicated or Cloud Server, quite obviously you will have access to your web folder. To access this web folder, we use secure File Transfer Protocol and File Transfer protocol. We have shouted many times, again – use sFTP with private keys for accessing your web folder from Windows Operating System, like WinSCP. If your Web Host has no option for sFTP, use a UNIX or Linux based Operating System to access the web content, simply because if your Windows OS has hidden virus or malwares, dear Google will find your website is distributing malwares immediately and its not funny to watch in search result instead of meta description there is written – This website might harm your computer or like that and people is always ready to rip your hard earned cash to get rid of those malwares. Whatever software you are using does not matter, without private keys, never save the password. With FTP, you can directly bulk upload intended plugins or themes to WP-Content folder. The full backup of FTP is needed for moving from one provider to another or make your safe in case the web hosting service fails and all things get deleted. Except RackSpace, Amazon, higher plans of Media Template no web host is likely backup your whole FTP everyday. Even with these web hosts, probably you will love to keep backup yourself. Backup is nothing, just simply copy paste the whole folder that has the name of your website on your hard disk. The next backup needed for full restoration is of back of MySQL data through PHPMyAdmin, that is another story. The most important content of FTP content is .htaccess; with which you can practically make your website working in the way you want. You can optimize WordPress by compressing data through .htaccess, Speed up WordPress by Gzip Compression from .htaccess and many more. We will compile our?WordPress Tutorial Series and make it available in easier way in future. This Article Has Been Shared 8490 Times! 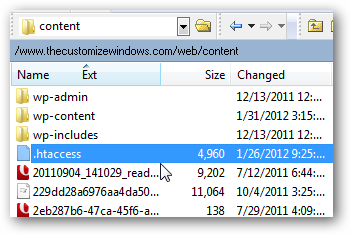 Cite this article as: Abhishek Ghosh, "WordPress Tutorial Series : Working with FTP Folder Content," in The Customize Windows, January 31, 2012, April 18, 2019, https://thecustomizewindows.com/2012/01/wordpress-tutorial-series-working-with-ftp-folder-content/.